The principle of this indicator is to monitor the rising temperatures, by taking under consideration the accumulation of the exceeded time. The organization CEMAFROID tested the GIOVATEMP system and stated that it is consistent with the standard characteristics. Security: Any break in the cold chain is indicated immediately and irreversibly. Unforgeable (can be identified by a serial number). Its serial number can be used in convergence with RFID systems. Environmentally friendly & Recyclable: Contains no heavy materials. Can be activated: storage at room temperature. Can be easily sent to you because it does not require any special storage conditions. 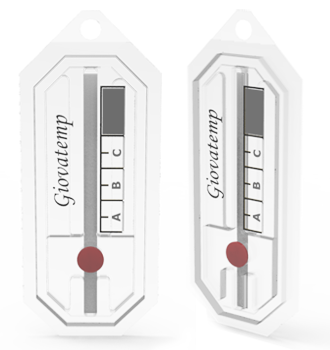 In order to make inviolable the cold chain control process, the indicator can be completed with numerous security seals, which will make impossible the replacement of the spy process by another GIOVATEMP. 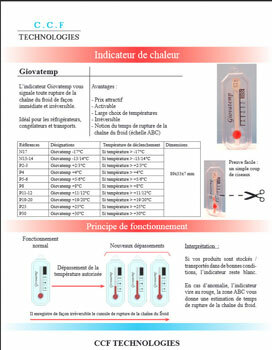 Ability to preserve evidence at the end of its activity cycle (HACCP Method). The serial number can be used in convergence with RFID systems (radio Frequency Identification). Proof of usage: cut with a pair of scissors.